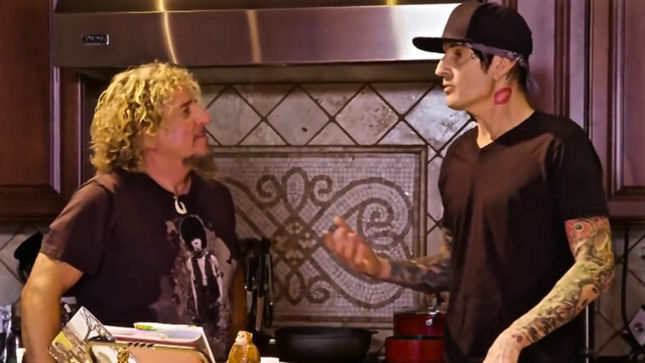 Sammy Hagar teams up with Tommy Lee of Motley Crue to perform a Montrose classic in a preview of the January 24 premiere of Hagar’s new AXS TV series Rock & Roll Road Trip. The debut episode of the 6-program series sees Hagar head to Sunset Boulevard to reminisce at the Whisky A-Go-Go before visiting with Lee at his house. After cooking together and exchanging stories, the pair are joined by bassist Michael Anthony to jam in the drummer's studio. The session was filmed prior to the end of Motley Crue’s farewell tour, which wrapped up on New Year’s Eve at the Staples Center in Los Angeles. The band’s final show was filmed for a theatre and Pay-Per-View release later this year. The AXS TV series sees Hagar drive across the country to jam with some of music's biggest names, including Bob Weir and Mickey Hart of the Grateful Dead, Heart’s Ann and Nancy Wilson, Alice Cooper and Alice In Chains guitarist Jerry Cantrell. As part of the recent 2015 hennemusic Rock News Awards, Hagar was named the No. 3 Rock News Artist Of The Year while also being a part of the No. 4 and No. 10 Rock News Stories Of The Year.